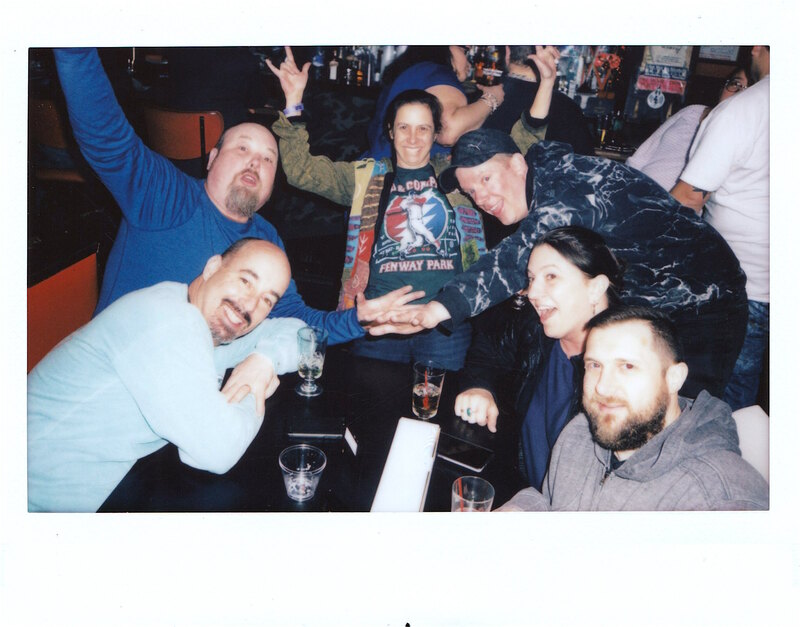 Rosemary’s regulars enjoying the styrofoam cups, 2/28/19 at 7:30pm. 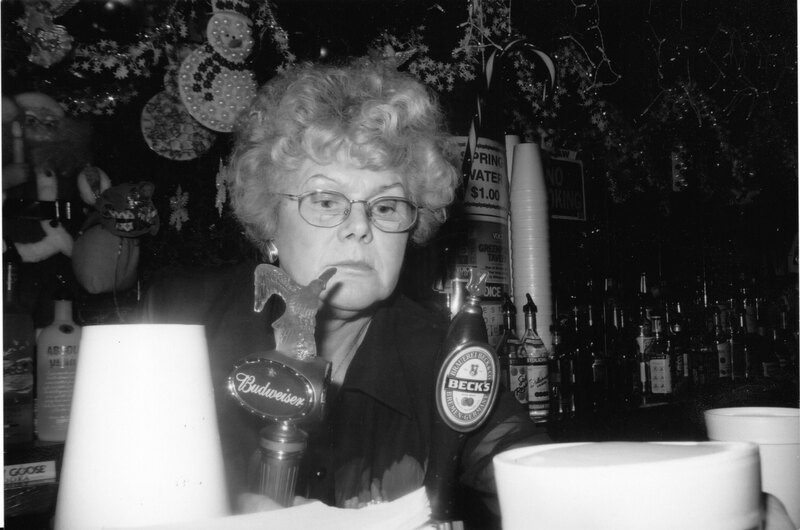 Rosemary Bleday– who once told us “This bar is Brooklyn to me”– wasn’t on hand to bid her namesake tavern farewell. 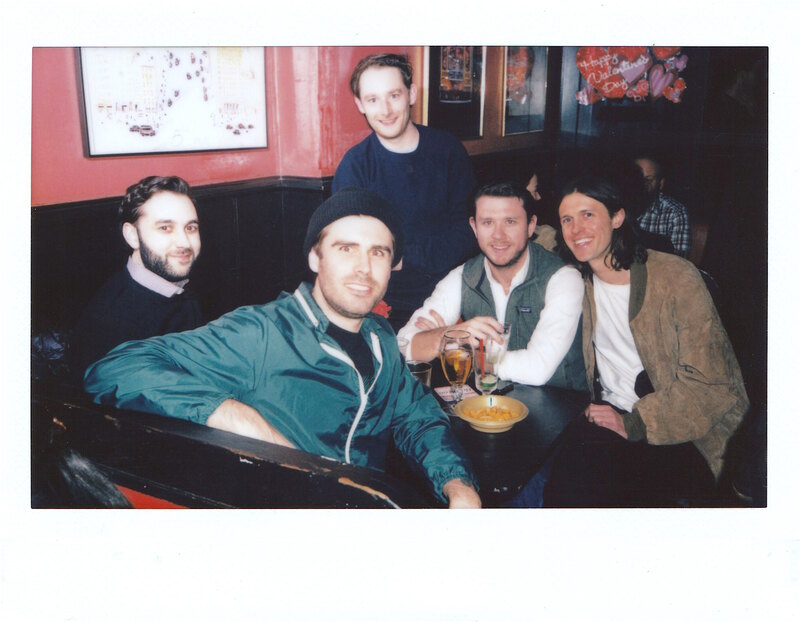 (Its home of 65 years has been bought by real estate developer Redsky Capital.) Grandson Eric Carson told me she’s been hospitalized for the past few weeks and that he and his parents, Bleday’s daughter Debra and her husband Frank, wished she could have been there with them. 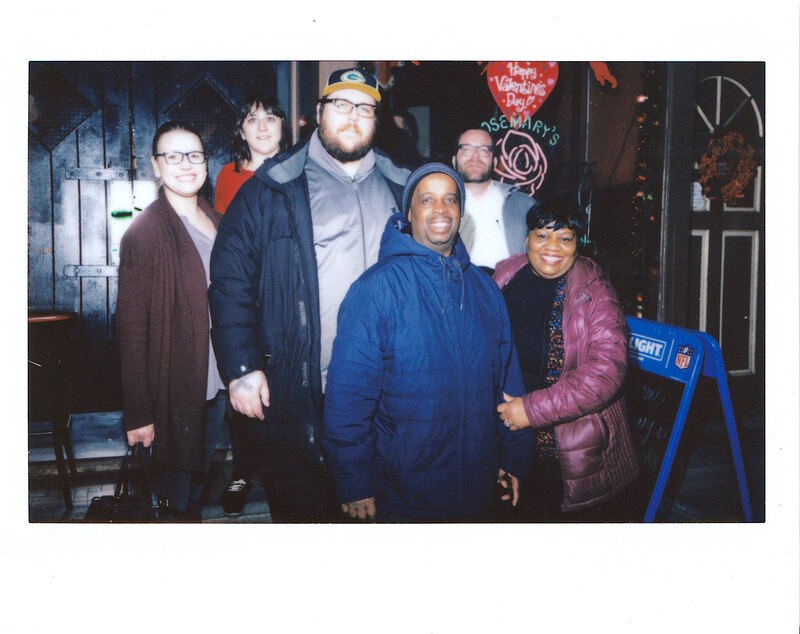 Rosemary’s owner and daughter Debra Carson (center, left photo) with husband Frank and son Eric (left and right) holding a photo of her mother Rosemary Bleday, 2/28/19 at 7pm. 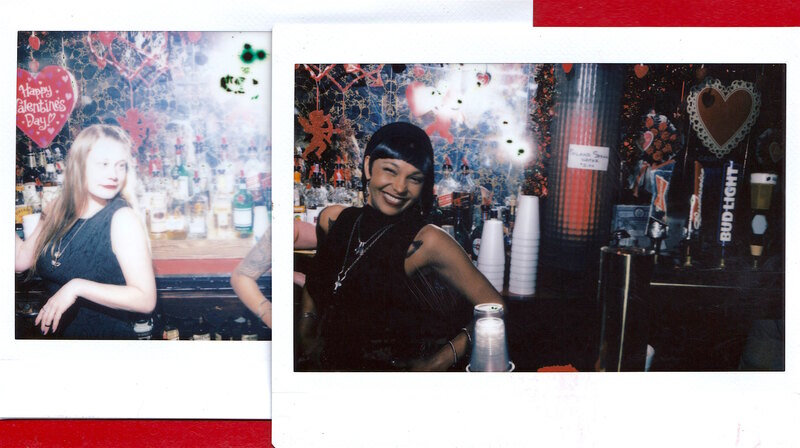 Also missing was longtime bartender Peggy, who I had photographed 15 years earlier on New Year’s Eve 2004. She was sidelined a year ago; when I brought in new prints of her, one of the regulars wanted them for a scrapbook that customers were putting together. Longtime Rosemary’s bartender Peggy pouring styrofoam cups on New Year’s Eve 2004. 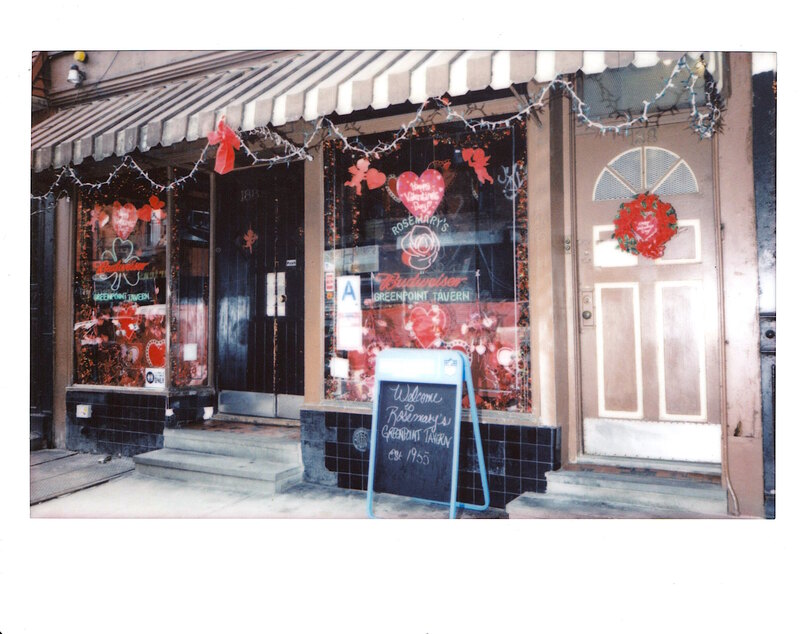 The exterior of Rosemary’s Greenpoint Tavern on its final Friday, 2/22/19 at 4pm. Smokers outside The Abbey, 2/28/19 at 9pm. 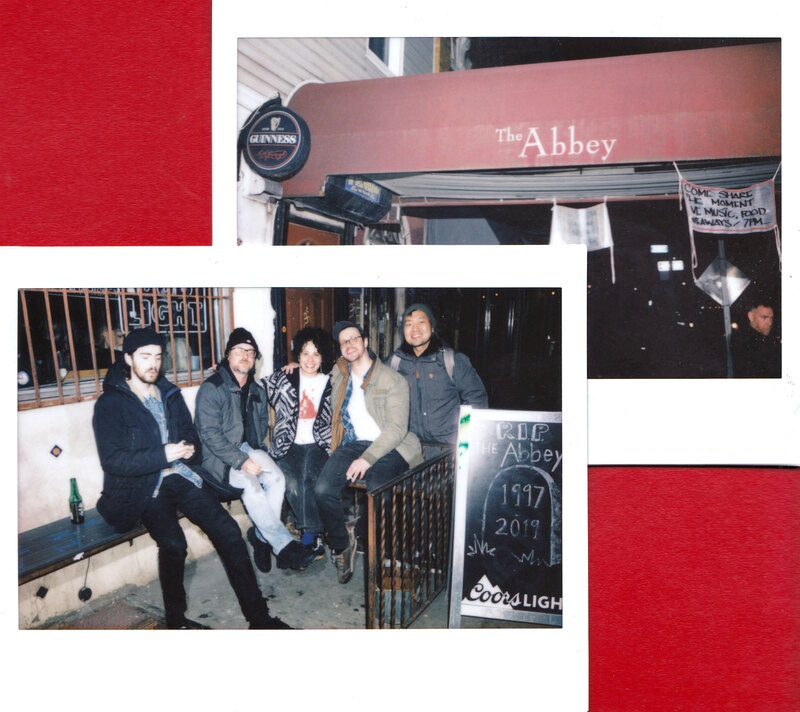 Soon after, The Abbey’s owner, Michael Kearney, walked in the door. At 80 years old, Kearney is a contemporary of his neighbor Rosemary as well as a fellow native New Yorker hailing from Hell’s Kitchen. 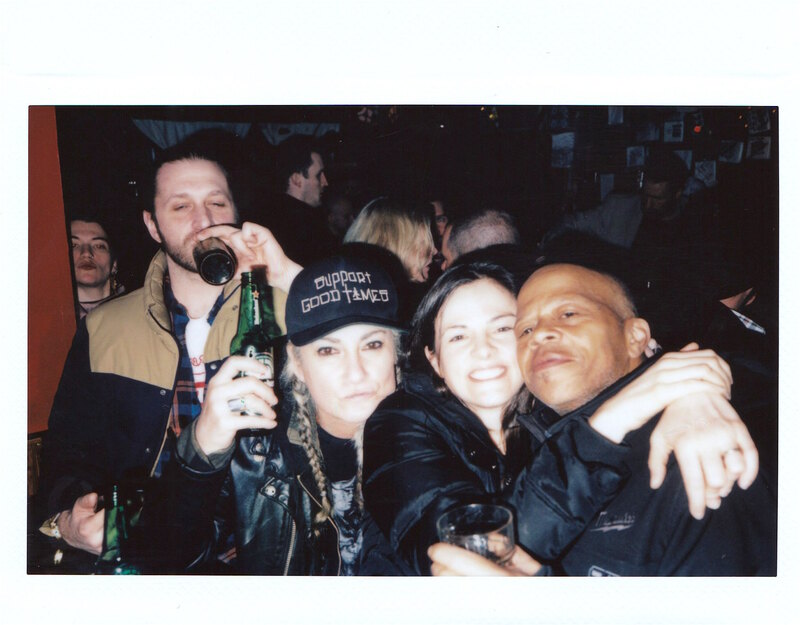 His daughter, Jessica Cloonan, told me how his small bar empire started years ago with a pioneering LGBT bar named Queens, for which he resisted intimidation from local bigots. Kearney has since become an owner of such diverse hipster havens as The Charleston, Metropolitan, Macri Park and Alligator Lounge. 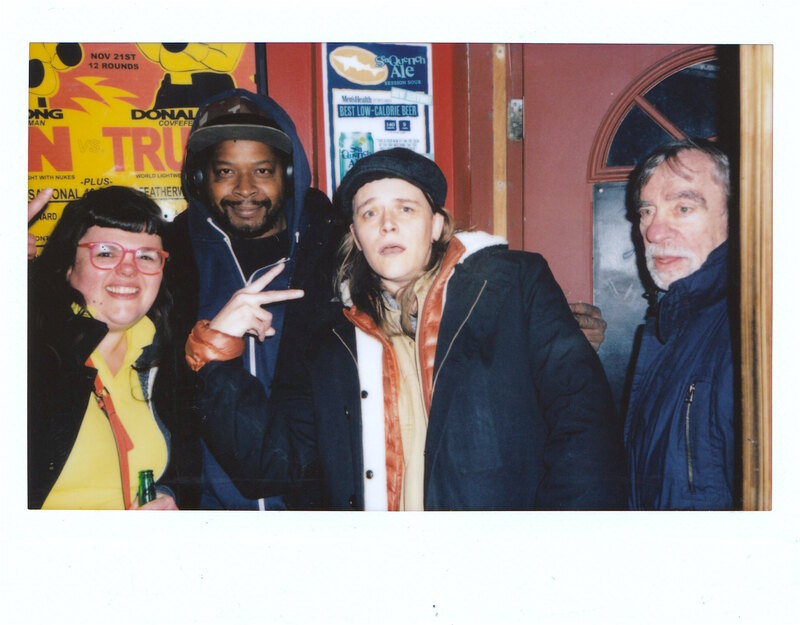 Former Abbey bartender Tania Cross (left) with doorman as owner Michael Kearney (right) walked in the bar, 2/28/19 at 10pm. 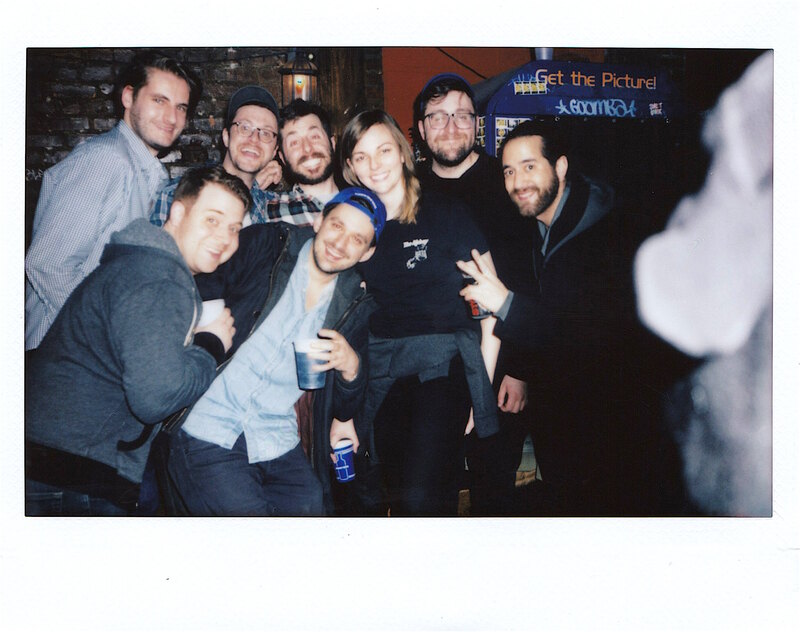 The Abbey’s sister-bar co-owner Paul Holland with his son (far left) on its closing night, 5/1/18 at 4am. 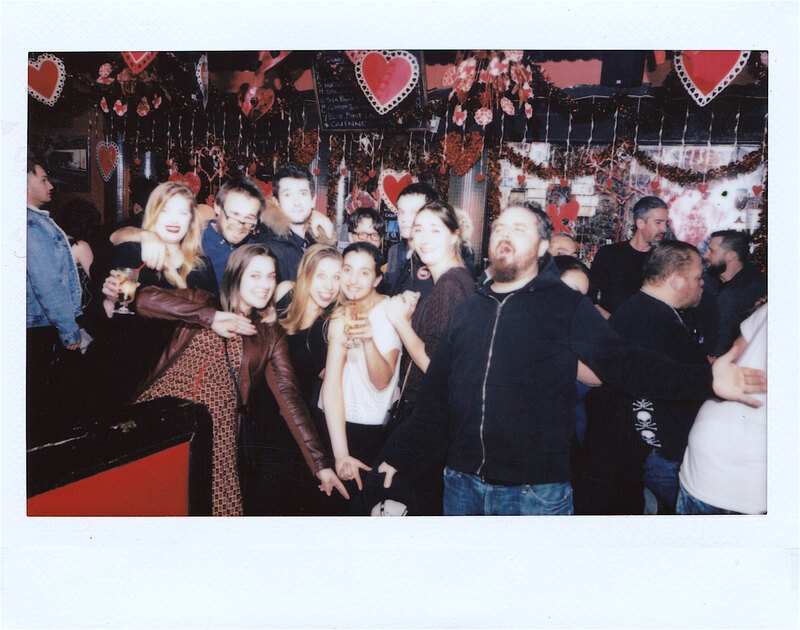 The Abbey bartender Polina Buckley giving a goodbye speech to her smokers, 2/28/19 at 9pm. 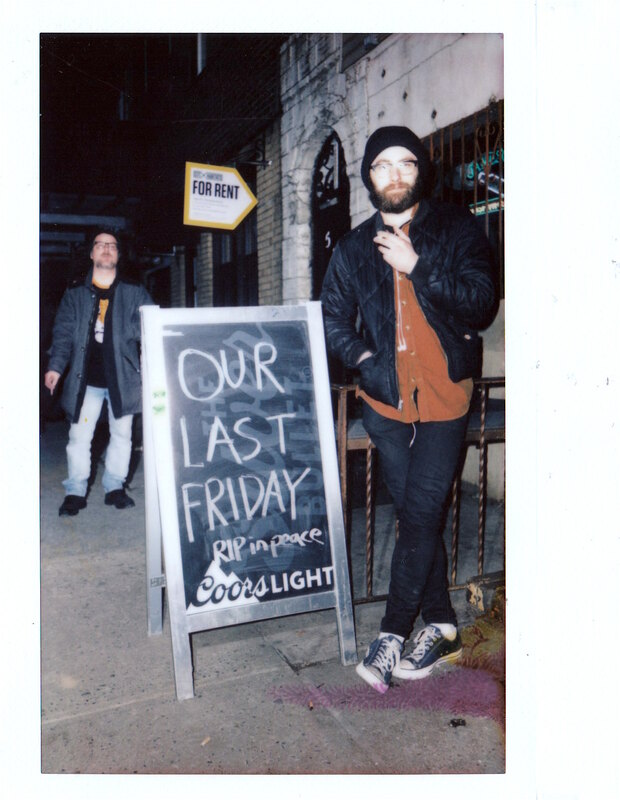 Longtime Rosemary’s customers enjoying its final Friday, 2/22/19 at 6pm. 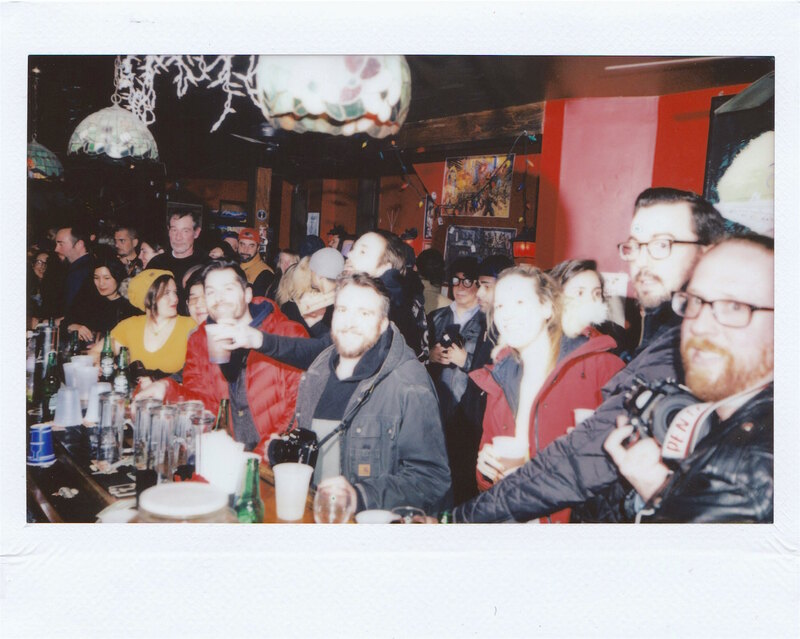 European tourists enjoying Rosemary’s for the first time, 2/22/19 at 6pm. 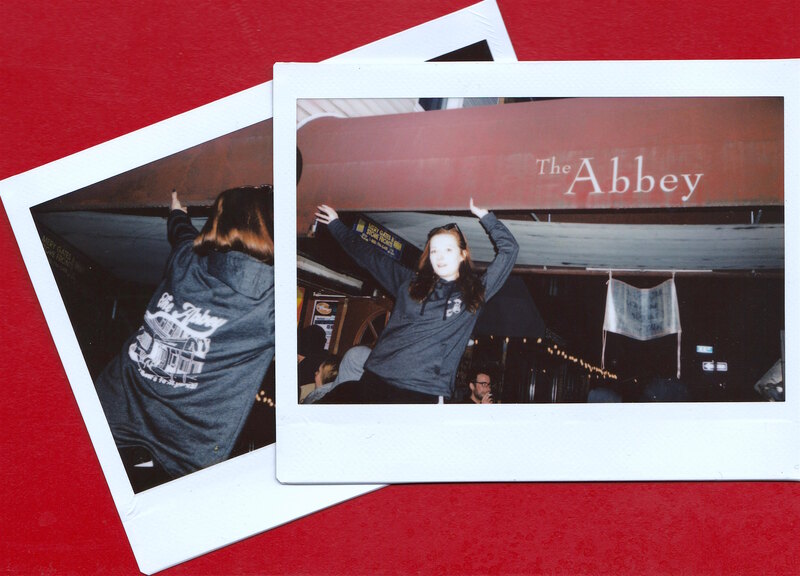 Patrons smoking outside The Abbey on its final Friday, 2/22/19 at 6:30pm. 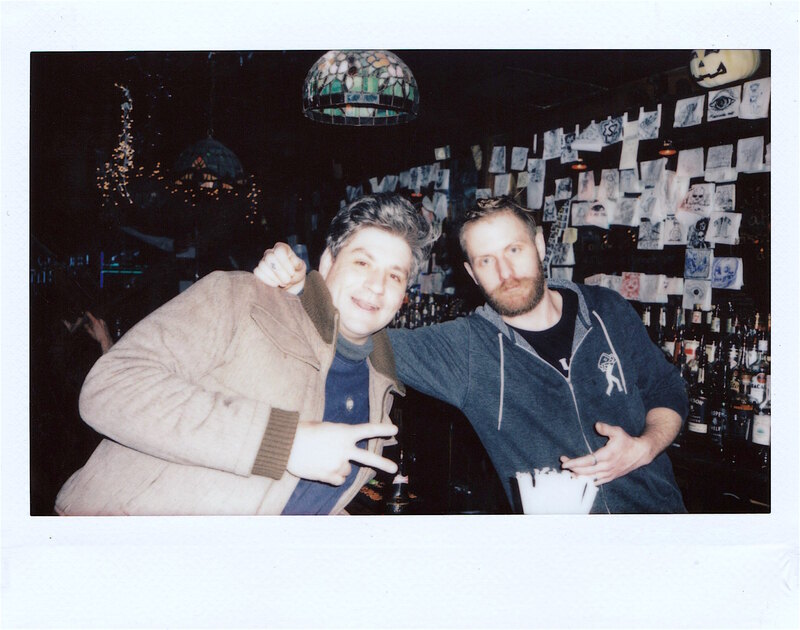 The Abbey manager David (right) with writer Nick McManus during his final Friday shift, 2/22/19 at 6:30pm. 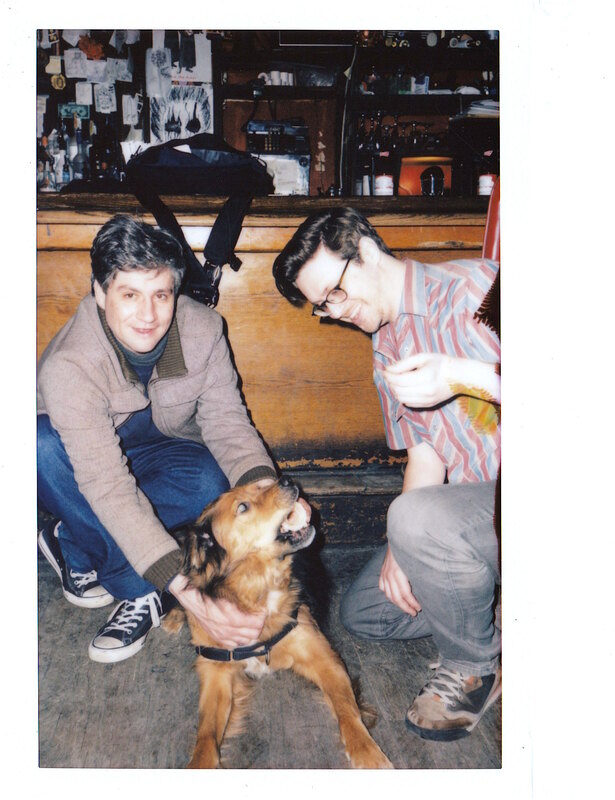 Writer Nick McManus playing with fellow Abbey patron’s large dog, 2/22/19 at 7pm. 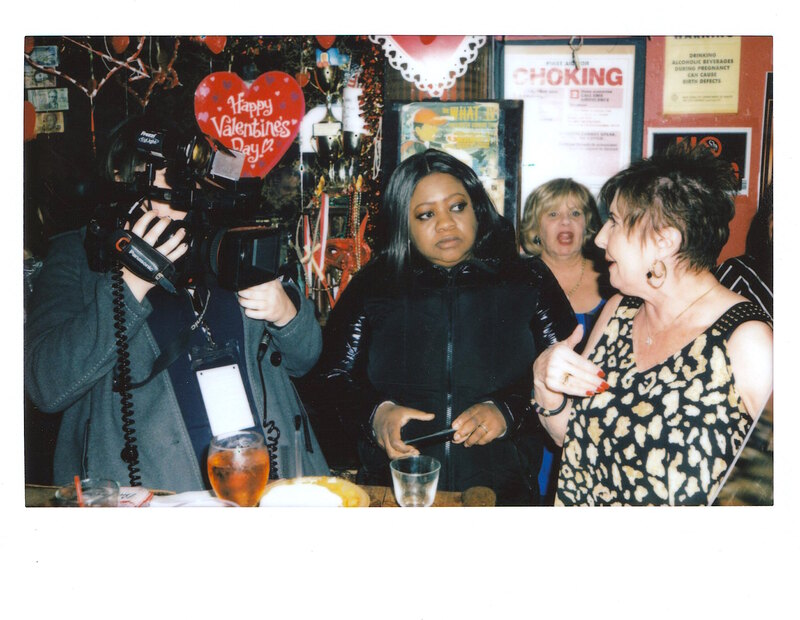 Spectrum News NY1 reporter Ruschell Boone (center) interviewing Rosemary’s owner Debra Carson (right), 2/28/19 at 7pm. 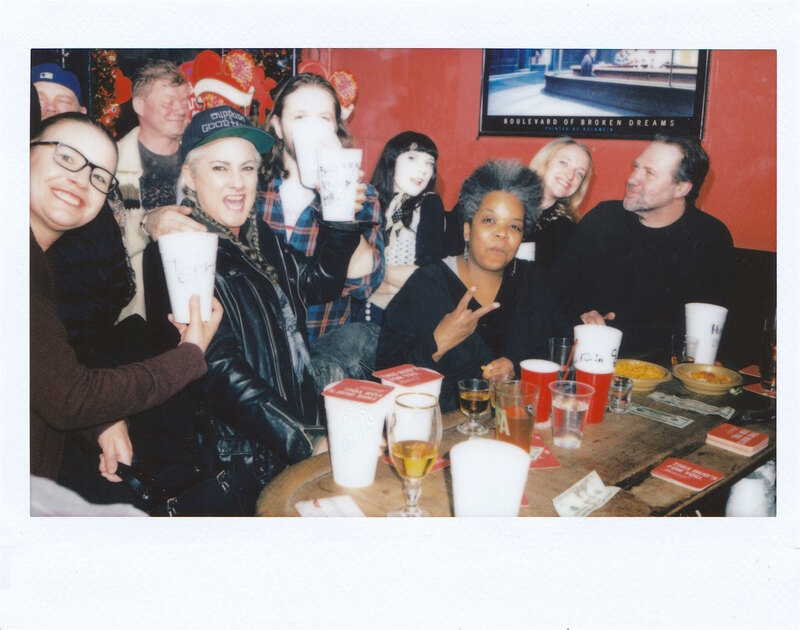 Rosemary’s bartender Crystal (center) soon after the styrofoam cups were ceremoniously delivered, 2/28/19 at 7pm. 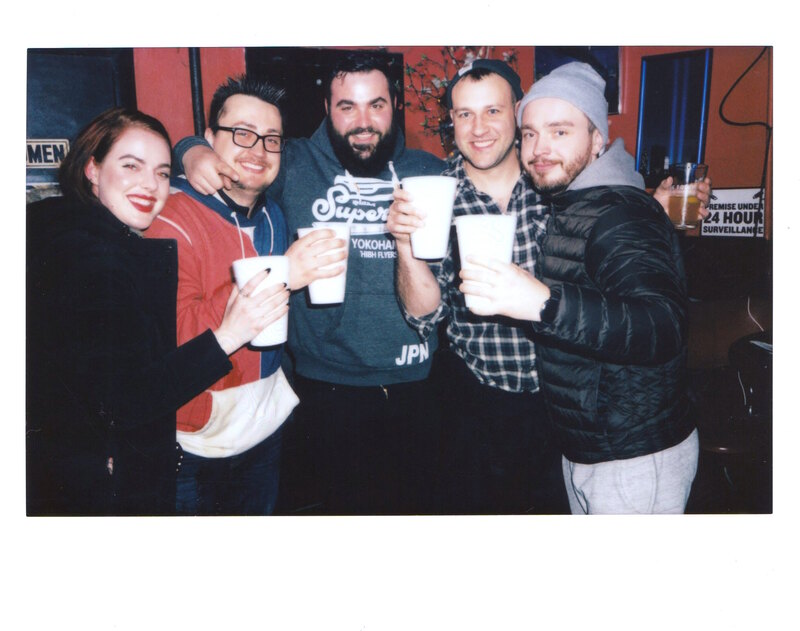 Rosemary’s patrons enjoying the styrofoam cups, 2/28/19 at 8pm. 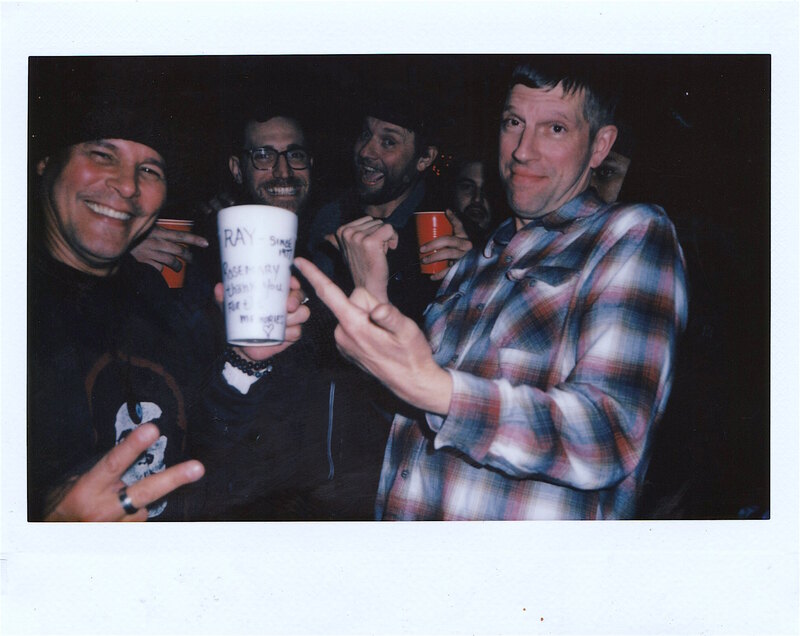 Longtime patron Ray with his signed styrofoam cup, 3/1/19 at 1am. Rosemary’s patrons seated at booth, 2/28/19 at 8pm. Rosemary’s patrons seated at booth, 2/28/19 at 7pm. 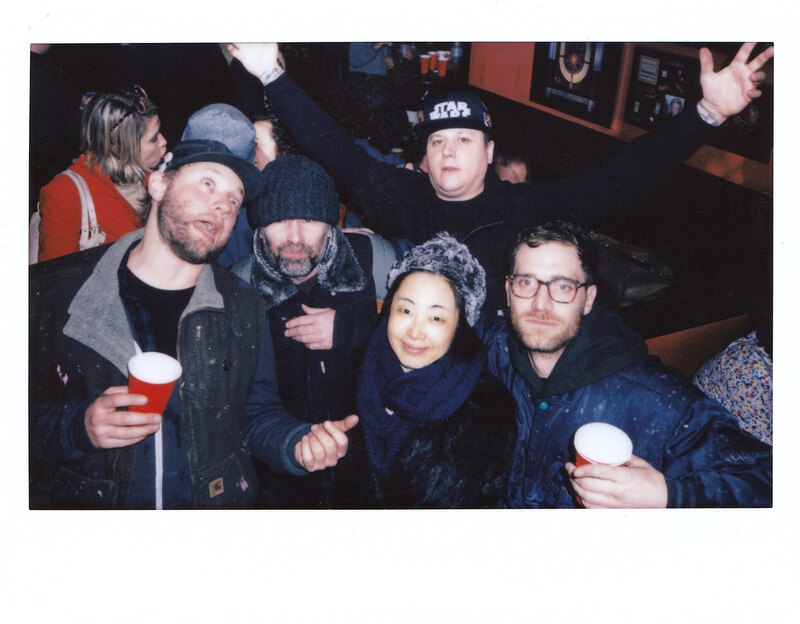 Local artists Bruce La Bounty, Russell Murphy (left and right), and bike messenger Stevie Steve, 3/1/19 at 1am. 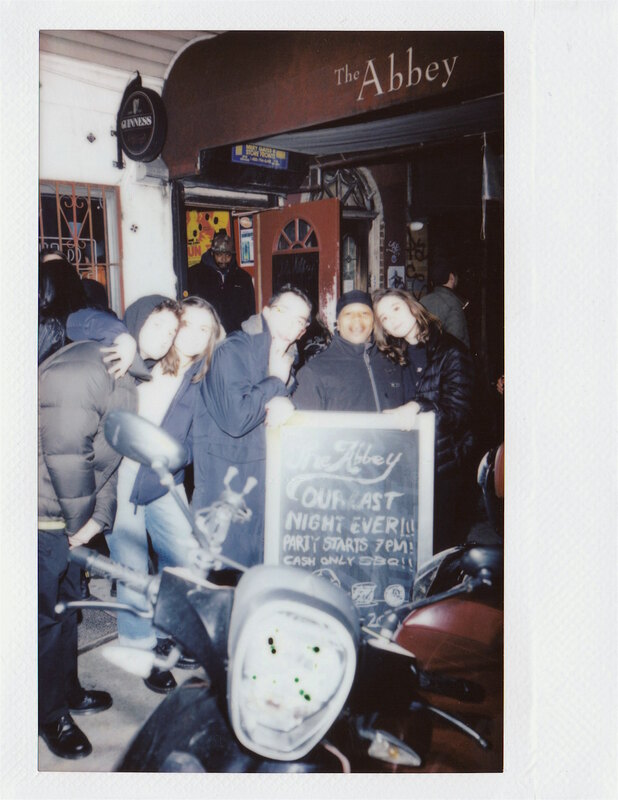 Rosemary’s doorman Tom with patrons during his final shift, 2/28/19 at 8:30pm. 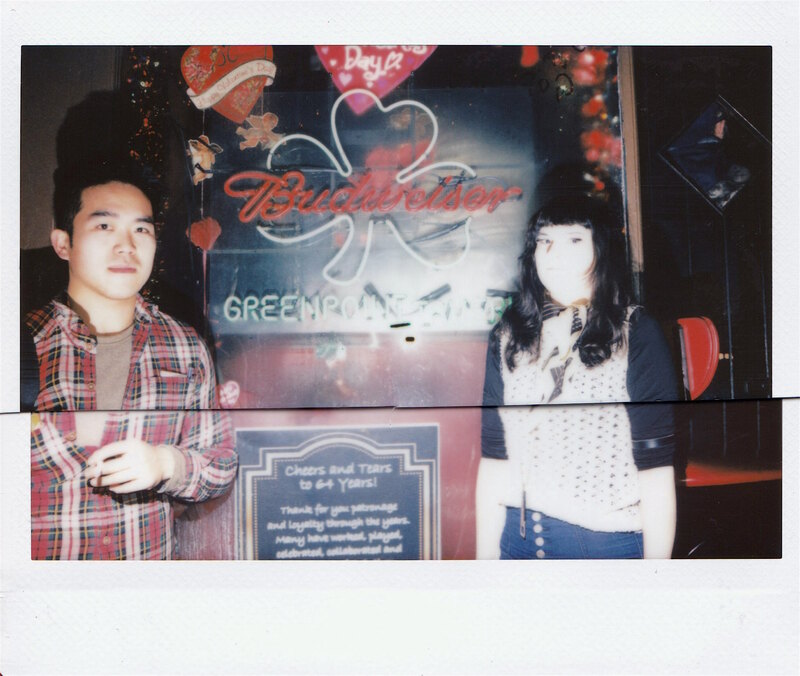 Rosemary’s bartender Renee Rodgers (right) with patron with the tavern’s iconic neon sign, 2/28/19 at 8:30pm. Patrons packed into The Abbey on its final night, 2/28/19 at 9:30pm. 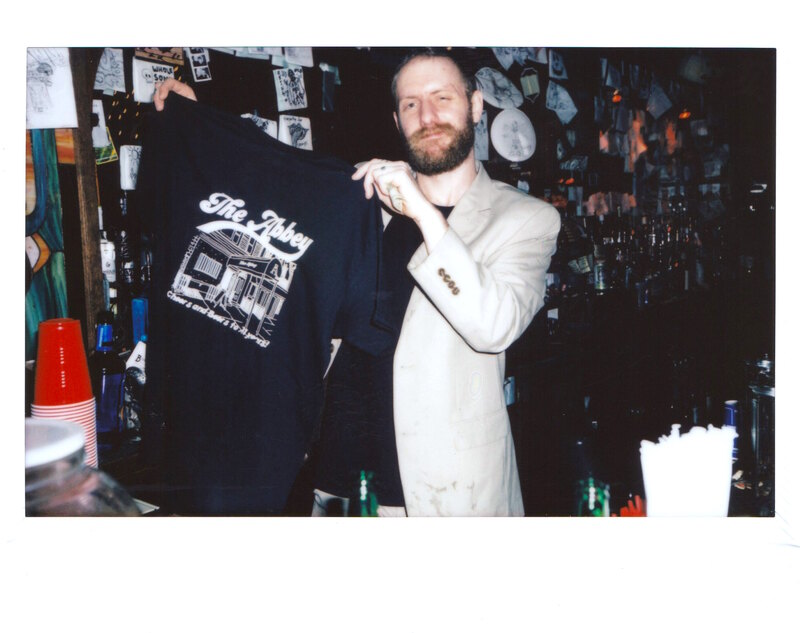 The Abbey manager David with the bar’s special closing t-shirts, 2/28/19 at 10pm. 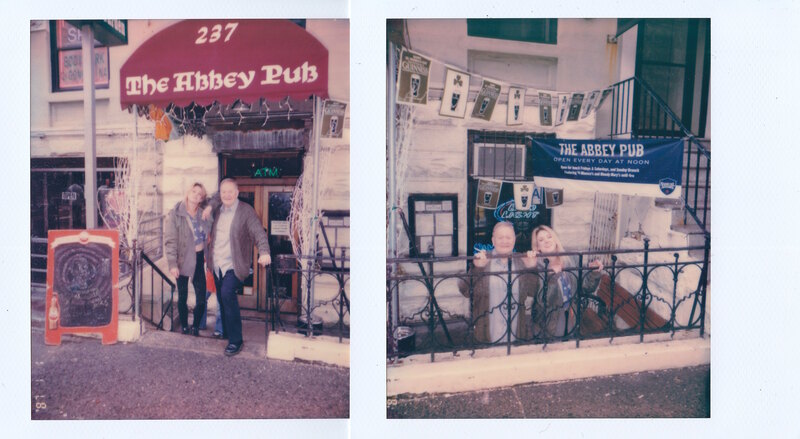 Exterior of The Abbey’s Manhattan sister bar of the same name on its final day, 4/30/18 at 3pm. 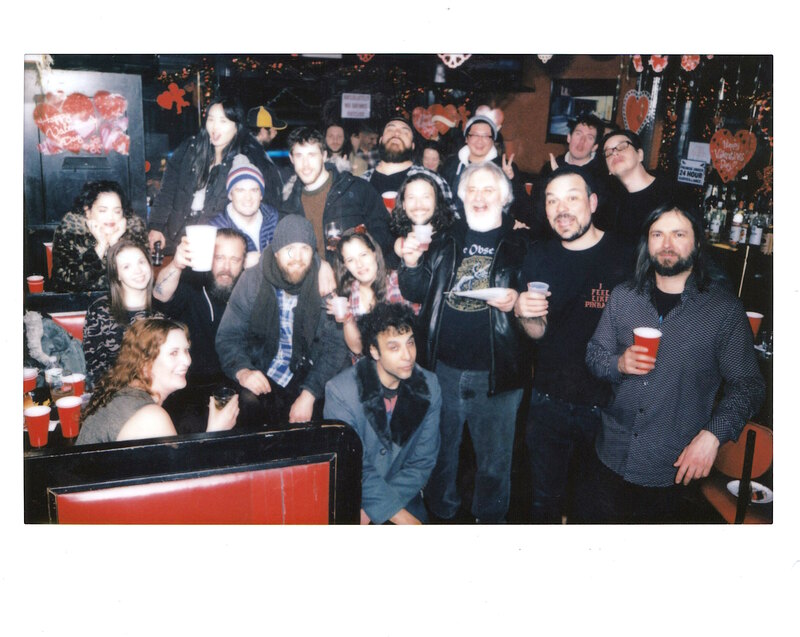 The Abbey owner Michael Kearney (center) with his daughter Jessica Cloonan (second right) and their former employees, 2/28/19 at 10:30pm. 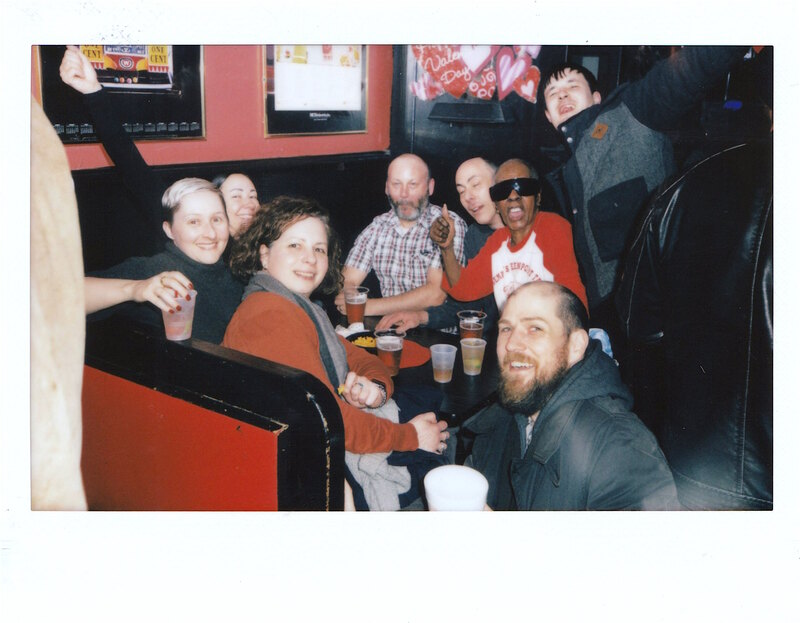 The Abbey’s patrons by the rear photo booth, 2/28/19 at 9:30pm. 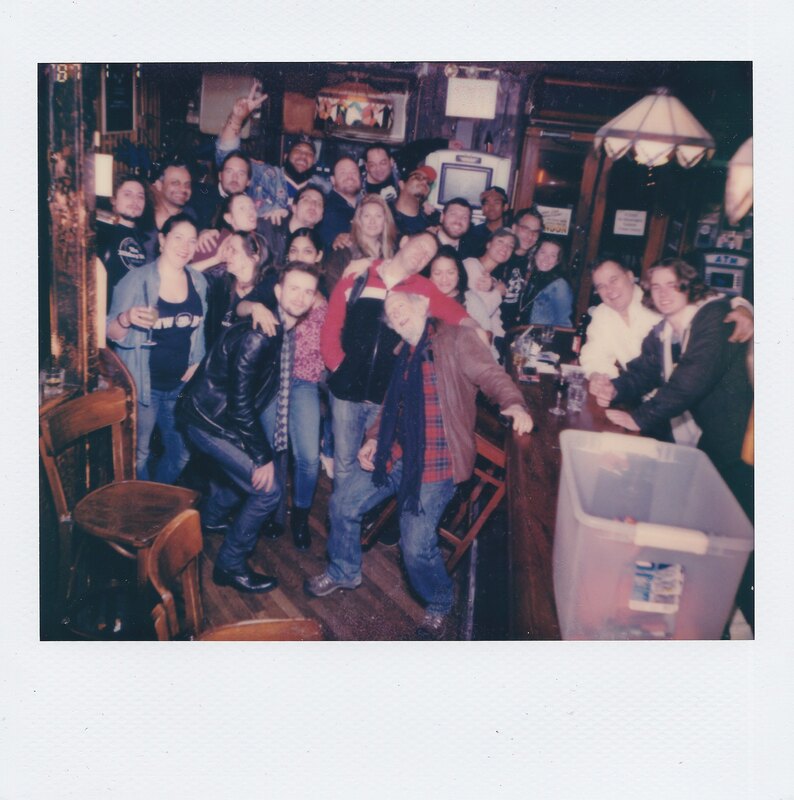 The Abbey’s barroom on its final night, 3/1/19 at 2am. 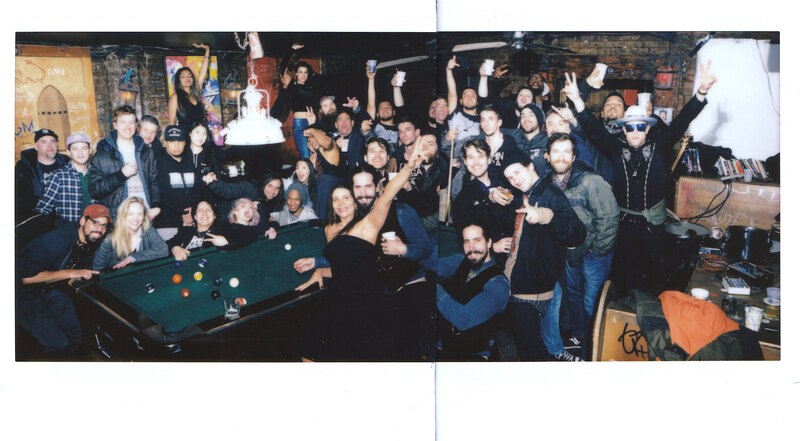 The Abbey’s patrons on its final night, 2/28/19 at 11p. 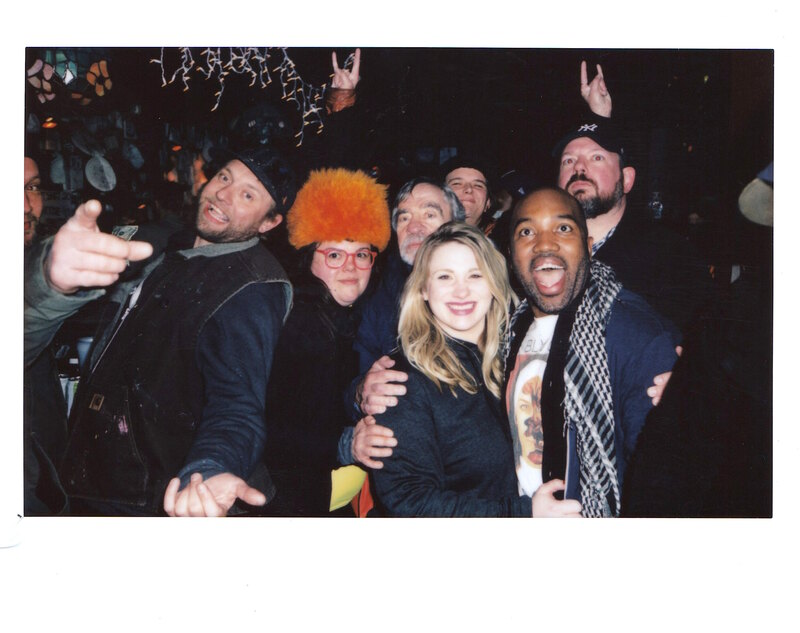 Exterior of The Abbey on its final night, 3/1/19 at 11:30p.